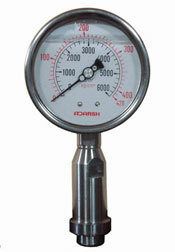 The ADARSH Homogenizer Gauge now lasts longer due to the new design feature incorporated inside the gauge. Generally homogenizer gauge is used in food, dairy industry on Homozenizer Machines. Since it is a hygenic application diaphragm seal is used. Further the presence of continuous pulsating media and that too at High Pressure causes failure of ordinary diaphragm gauges. At Adarsh a diaphragm seal has been specially designed to sustain this high pressure pulsation and vibration. Available upto ranges 700 kg/cm2, bar / 10000 psi.